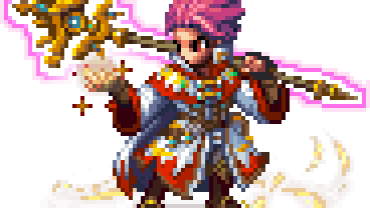 Sandee is a 6-star unit who plays the Healing and Magic Damage roles. Her stats are well rounded for both these roles and skills are set up to support them. Sandee only has 5 active skills so compared to some other units of these two classes she can seem a bit limited. But with the 5 she’s given she’s still well outfitted for healing and Magic Damage. Dream Demise is her go to magic damage move, aside from her actual magic that she has. It’s a decent AoE attack with a healing effect stacked onto it. A good skill combo for Sandee is using Foresight Dream for the physical attack negation and 50% magic increase. Then throwing out Dream Demise or Banishga for heavy light damage. Nightmare is a decent move as well throwing out a random status ailment for 20% to all enemies. The randomness isn’t too appealing but any affliction is better than none. All around she’s a pretty good healer with some good buffs and debuff. For a magic damage unit she really only has 2 attacks that cover this role, though her Limit Burst makes up for in some resort having damage with a list of other effects. Verdict: Not the best Healing or Magic Damage unit out there but a great one if you lack a good unit for either role. Sandee is neutral to all elements and status ailments. Sandee can equip 3 weapons and 5 armor. A maiden who dreams of calamities yet to pass and warns others of these through ominous oracles. Sandee once saw a vision of the world’s destruction and warned the king of the impending doom she had witnessed. Unfortunately, this only served to brand her as a dangerous figure, ultimately resulting in her prompt exile. Sandee then set off on a journey to search for a means to prevent the catastrophes looming ahead.